For background please take a look at the first Speedo post. Good mix of activities on Monday this week. Neil was in the workshop creating plenty of wood chips on the lathe. James brought in an xBox One Kinect Camera (v2) which was used for 3d scanning and skeleton tracking via the windows SDK. Now the plug packs have come down in cost there seems to be plenty of hacking potential here - A definite upgrade on the 360 Kinects we have been using. This week at hackspace is much quieter compared to last week. On Monday…. Toby and I worked on the Shapeoko CNC project which has stalled slightly. Got it moving and cutting but still need to tweak the config. Can you laser engrave a Macbook without frying it? 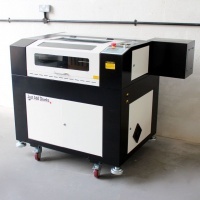 After a long wait we finally took deliver of a fine Greyfin A2 laser cutter. LASER all the things! The Men's shed has provided us with a home for nearly a year now. While they have been gracious hosts we have always planned to have our own space. We currently have access to Men's shed for 4 hours a week and with the new space we will be able to open everyday.